Your woods can be productive for generations when managed correctly, and still bring you an income. A formerly mismanaged forest can be brought back to a more natural existence supporting a myriad of wildlife, vegetation and quality timber. By choosing to remove some trees, you can give nature a chance to regenerate itself. Managing a forest isn't wholesale chopping and logging. It is a controlled choice of which trees should be logged to allow the forest to sustain itself. Instead of taking every tree now, and possibly irreparably harming the forest, management of a stand allows a forest to produce trees that can be harvested many times over without harming the environment. Hiring a qualified Consulting Forester will assure your forest remains productive for generations; striving to maximize all aspects of the forest community. 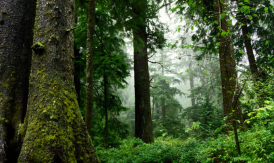 Hiring a qualified Consulting Forester will assure your forest environment will be considered as a whole, including timber production, wildlife and plant life.